The Atlantic salmon (Salmo salar) is an anadromous fish species, which spawns in freshwater and migrates to the ocean to take advantage of marine resources for growth. As mature adults, Atlantic salmon will return to natal freshwater streams to spawn. The lifecycle is complex; within the freshwater environment, fertilized eggs develop into eyed eggs, alevin, fry, and parr. Typically, after 2-3 years, parr undergo smoltification – a series of physiological changes that prepare salmon for the saltwater environment. Smolts migrate down streams or rivers to the ocean in the spring. After one or more years at sea, the adult salmon return to spawn. Even though spawning does not take place until fall, and only a few weeks may be needed to reach spawning grounds, some salmon will migrate up streams and rivers months in advance. Timing of spawning migrations can vary significantly between rivers as well as between individuals. Atlantic salmon run-timing may be influenced by marine growth rates, mortality and characteristics of the freshwater environment. ‘Sea age’ may also play a role in run-timing. Adult salmon that have spent only one winter at sea (known as ‘grilse’) seem to enter rivers later in the season compared to salmon that have been at sea for two or more winters (known as ‘multi-sea-winter’ salmon). Salmon may enter rivers early to avoid the dangers of the marine environment (e.g. predators) or to avoid elevated temperatures or low flows that can impede upstream movement in the summer. Figure 1. Burrishoole catchment, West Ireland (Photo: Thomas Reed). A group of researchers led by Thomas Reed from the School of Biological, Earth and Environmental Sciences at the University of College Cork in North Mall, Cork Ireland conducted research to learn more about river characteristics and their influence on Atlantic salmon run-timing. They hypothesized that premature spawning migrations would be observed more frequently in rivers that provide adequate holding habitat (e.g. lakes, large pools or deep, wide and slow flowing streams). Adult salmon stop feeding when they enter freshwater. 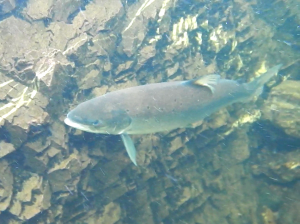 Therefore, early spawning migrations can have energetic costs unless cool water habitat exists where salmon can hold and minimize their energy expenditures. Ireland provided an ideal study area. Temperatures rarely exceed 20°C and the country receives abundant rainfall, allowing researchers to rule out adverse river flows or elevated temperatures as a cause of early spawning migrations. 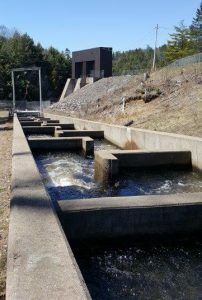 Reed and colleagues used angling records to track salmon run-timing and GIS data to characterize available salmon habitat located downstream of impassable barriers such as natural waterfalls or man-made dams. They found significant differences in the number of early migrations between rivers. River systems that included lake habitat had more salmon migrating early in the season (prior to May 31st). They noted that early migrations occurred most frequently at intermediate river sizes rather than increasing as river size increased. The research team concluded that in Ireland, Atlantic salmon may migrate early to avoid the additional risk of mortality of the marine environment, but in doing so they sacrifice growth. This strategy is only effective if appropriate habitat is available where salmon can hold and minimize energy expenditures. The greater incidence of early spawning migration observed in this study supports these conclusions. Reed and colleagues caution that other factors, many of which vary geographically such as temperature, flow regimes, etc., may play an important role in determining run-timing. Future studies considering fine scale timing patterns and population-level effects are needed. Atlantic salmon are endangered throughout much of their range, particularly in North America. Learning more about run-timing and its effects upon population dynamics would be incredibly useful for fisheries scientists and managers working to preserve this majestic species. Reed, T.E., E. de Eyto, K. O’Higgins, P. Gargan, W. Roche, J. White, N. O’Maoileidigh, T.P. Quinn and P. McGinnity. 2016. Availability of holding habitat in lakes and rivers affects the incidence of spring (“premature”) upriver migration by Atlantic salmon. Canadian Journal of Fisheries and Aquatic Sciences, 10.1139/cjfas-2016-0191. Next story Where are Striped Bass when they aren’t Migrating?